I've been eager to watch an older music video from Macklemore, so now that I've covered "Good Old Days" featuring Kesha, I thought it was the perfect excuse to delve into Macklemore's previous songs and pull this one out for my Thursday Revisit. It really does encompass the song's title and the lyrics. It's not surprising that he managed to build up his career if he was previously releasing treasures like this one. 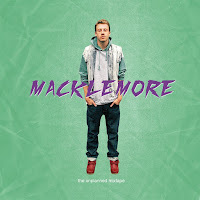 Watch Macklemore perform and present the town in his debut music video for his song "The Town". Macklemore, real name Benjamin Haggerty, originally released this song and music video, along with a few others all before he became famous when he teamed up with Ryan Lewis. They've had a successful career to-date as a duo, but they are currently on hiatus as they pursue solo projects. This song's music video is Macklemore's debut video and has an air of "Good Old Days" to it, which has just been released in collaboration with Kesha - and is the sole reason I'm reviewing this today. The song hits us all in the heart emotionally from the very first verse; Macklemore can seriously write some amazing lyrics; like, WOW! This was worthy of being a hit, although there is only a simple melody and rhythm to the song; however, it's the lyrics themselves and Macklemore's delivery that makes this one we all need to treasure. Directed by Zia Mohajerjasbi, this music video seriously is incredible. The town of Seattle is fully shown throughout the clips, the people, the city, the photos, the events, everything. Linking in perfectly with the song. There's a performance piece with the city skyline behind Macklemore, and it has his usual energy. He really means every single word of this song, and it's so heartwarming to see that. The main scene that makes an impression on all of us, is the table filled with flyers and photos that represent music from Seattle in every way. It's great to see this side of Macklemore, and his ability to flood a song like this with emotions. The lyrics are outstanding in every way, and it's great that the music video manages to represent the song totally.